PannaCrema is Italian based, quite small, and fairly mysterious, due mainly to their awful website that tells one nothing about the company’s history or philosophy. Nor does the site list retailers or ingredients, and the scent descriptions are, umm, vague and poorly stated, to be generous. PC nevertheless has an excellent under the radar rep for packing a lot of high quality ingredients in their formula, along with that cool Euro image. Sturdy plastic jar, with 7 ounces of capacity and less than 5 ounces of product, a good ratio allowing ample headspace at the top to allow easy mess free loading of the soap. Ingredients are listed (good to see them somewhere!) and my only issue is that there is no scent description. Considering the title of this scent is “Vetiver” the pronounced absence of vetiver in the actual scent leads me to deduct a point. If you are selling to blind buyers who cannot get a sniff ahead of time, IMO, if you call a soap “Vetiver”, it should be a clear powerful vetiver, not an equivocal nuanced vetiver that is overpowered by other scents. If they called this “Citrus Vetiver” or “Italian Vetiver” I would have no issue, but truth in advertising concerns annoy me when a simple scent is not properly described. 1 of 2 points. Easy as pie. Not much product or water needed. Lather is fairly stable once applied, but did show some signs of thinning towards the end of my second pass. The lather still worked very well though, so the thin appearance did not create any deficient performance. I’m taking a point off due to the appearance of thinning, as shaving should not be an alarming experience on any level. 4 of 5 points. Simply great. Smooth glide, excellent cushion. Ghost lather effect was a tad less obvious in effect, so you may want to be cautious about shaving spots where you have already taken lather off during a pass. No sore spots observed after the shave, and the thickness of the lather did not create any clogging issues for the Progress. I am tempted to deduct a point for the absence of ghost lather effects, a feature which other contenders in Series One had plenty of, but I maintain that ghost lather is a privilege rather than a right in using shaving lubricants, so the shaver should never assume the persistence of lubrication in a spot where lather has been shaved. Call this 4.5 points, rounding up for the other excellent characteristics. 5 of 5 points. Sadly, not much happens. The same balance of sour citrus and mild vetiver loiters around, and does not develop. It remains constant and noticeable during the shave, which is nice, but it continues to mumble “lemongrass” instead of shouting “VETIVER!!!”. When rinsed at the end of each pass, the PC goes away altogether, a disappointment, as that moment (the rinse) is usually when the smell is strongest and most developed. Instead, PC Vetiver just exits quickly and ignominiously, like a disgruntled guest leaving a bad hotel. I feel PC utterly misses the complexity of Grey Vetiver, in terms of absent spiciness and sweetness, and all we get here is the relative easy part of the GV scent pyramid. If GV was indeed the model for PannaCrema’s design, they missed the mark widely. Even if we consider PC Vetiver on it’s own, it is a mild and rather dull scent. Though it is more powerful of a scent than Catie’s UJG, it is also more boring. I would rather smell what there is of UJG than the more robust though monotonous PV Vetiver. At least the odor doesn’t fade away during the shave anyway. And it more or less fulfills the limited promise of what can be smelled in the tub, so what you sniff is what you get here. 3 of 5 points. None during or after shave. No complaints, so no points deducted. Just fine. The castor oil and shea butter worked as expected and gave me a fine feeling adequately moisturized face with just a splash of Nivea Sensitive Cooling Balm applied. Guys with less sensitive and dry faces could probably get by with no post shave finishing applications at all. 5 of 5 points. Meh. $18 for 4.8 ounces is more or less the market average in the artisan soap world, and the technical performance is excellent. But all too many other soaps have these characteristics of decent value and excellent technical merit. If this soap was cheaper or had a memorable, amazing scent, I’d give it 4 or 5 stars, but given its dull simple scent, along with the proud proclamation of being something it is not in its very title, I am awarding 3 of 5 points. If you like lemongrass and / or do not expect much from your soap scents, add a star. B Minus. This one is not a thriller. The technical reputation of PannaCrema is not undeserved, but many, many other soap makers match this level, either with or without similar formulas (Barrister & Mann, Wholly Kaw, Catie’s Bubbles, Soap Commander for instance.) Most of these other makers beat PC’s price and value figures, and are also easier to find and sample. And all of the artisans mentioned utterly slaughter PannaCrema in scent design and execution. Also, as mentioned, Vetiver is more or less at the apex of PC’s line in terms of scent quality, so if this is the best they can offer, I would recommend just passing on the brand altogether. Certainly if you were looking for a Grey Vetiver match, this is close, but not that close. Basically, having lots of citrus up front, and weak vetiver. But then no spice, no sweetness, and no development. Ingredients (From Package):Water, Stearic Acid, Tallow, Potassium Hydroxide, Coconut Oil, Shea Butter, Castor Seed Oil, Glycerin, Sodium Hydroxide, Fragrance, Kaolin (clay), Ascorbic Acid. I like Vetiver, but only when it is not the dominant scent. I sampled L’Occitane’s Vitiver EdT and found myself nauseated by it. I think any of the first three soaps in the series would be fine for you, as vetiver definitely is a complimentary note. Actually, the interesting thing about this review series is how even soaps that claim prominent vetiver actually mellow it out quite a bit with other fragrance elements. I think of the 8, there are only 1 or 2 that you might find problematic if you dislike “straight up” vetiver. We must have bought a different product. My PC Vetiver had a wonderful scent. I have had it for quite some time now and the aroma is still refreshing and delightful. The soap lasts a long time and its performance is about the best I have ever experienced. As background, I have been traditional shaving for more than 50 years and have tried numerous soaps ad creams. The PC line, particularly the Vitiver and San Francesco, are among my top choices. Great quality and performance. We do agree on the excellent performance of PC soap, and as for the scent part, well, opinions on scent are very subjective and personal; scientifically, it’s been shown that there is the most sensory divergence in how people perceive scent as compared to other sense inputs, and then of course there is the personal opinion of what one is perceiving. I think actual long term experience with wet shaving may be a hindrance in appreciating newer artisanal output. For prior decades, the extremely small wet shaving market was dominated by a few European firms who produced fairly conservative and / or mild scents, and PC (IMO) sits firmly in that tradition. In the last 3-5 years, smaller domestic artisans (for the most part) have shook things up by producing stronger scented and more innovative fragrances for use in shaving soaps. 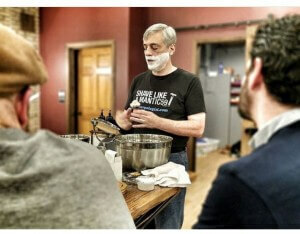 Companies like Catie’s, Barrister & Mann, Cold River Soap Works, etc have actually redefined how a shaving soap can smell. Of the 8 soaps I evaluated for these articles, I honestly feel PC Vetiver ranks dead last in terms of innovation and scent power. If you like PCV, the following soap up in the series next week will probably amaze you even more, and even Catie’s contender from last week would likely impress you if you gave it a shot. Keep an open mind, and try a few of the other soaps and brands mentioned, and you may find a few new favorites. Samples are available for some if not all of these products either directly from the artisan or from some online vendors that are willing to provide samples. In the end, you and I may respectfully agree to disagree on the merits of PC Vetiver, but we do share a consensus on its fine performance, and if you enjoy it’s scent, then I am glad…but you may enjoy some other scents as much or more also! I guess that’s where we differ. I prefer a more subtle scent in my soaps. I have tried B&M and Caties Royal Garden. Caties had a scent that was strong but I did not find its performance as good as PC. The B&M Adiago soap is top rate as far as performance is concerned. I am one of those guys who ends up buying a soap from every new artisan that comes out but I find I go back to the classics more often than not. Tabac, MdC, MWF, Cella, the original AoS soaps, etc. are still my favorites. And Barrister and Mann’s “Vetyver Santal” (to be reviewed soon) is another very refined and subtle scent that you may also like.